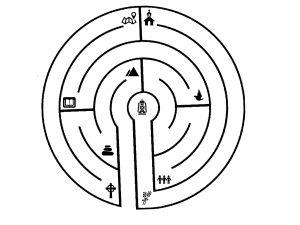 The prayer labyrinth is an ancient prayer exercise. 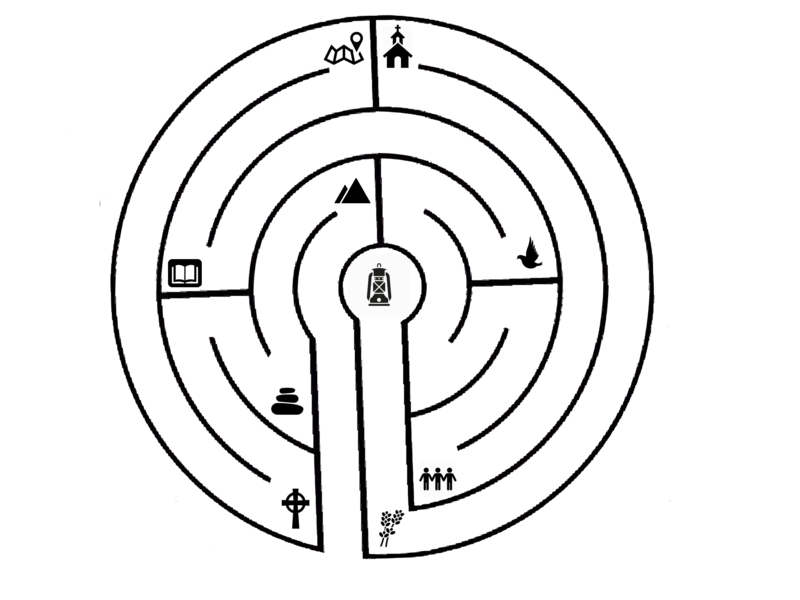 It is not a maze, there is only one way through the labyrinth. The twist and turns in the exercise reflect our process as we work/talk through an issue we are dealing with in our lives. The stations within the labyrinth serve as reminders and prompts to take our time with God even deeper. The stations are listed and described below with the corresponding icon/number. 1 Mountain – The Mountain represents the task before us as we come before God in prayer. It is a place to stop and acknowledge our life and what all may be happening in it. 2 Stones – The stones represent the burdens that we carry. It is a place to stop and acknowledge what it is that is weighing on our hearts. 3 Cross – The cross represents both surrender of our burdens to Christ but also how we have access to God through the gift of Christ death on the cross. Through the cross we have bold access to God. 4 Map – A map represents our need to be taught and directed in our lives. Whether this be through what we experiencing or a decision facing us, it is a time to stop and seek God’s guidance. 5 Scripture – The Bible, God’s living and active Word, is how He so often speaks to us. This is a time to stop and jot down any scriptures that come to mind as you work through this prayer time. How may God be speaking to you? 6 Spirit – The Holy Spirit is our counselor, a counselor does not solve our problems for us but walks through them with us. This is a time to stop and acknowledge God’s presence in the midst of our lives, no matter where we are. 7 Community – It is not good for man to be alone. Growth most often happens in the context of community. This is a time to stop and seek God in how you can involve the community of God into this situation. 8 Church – Community is found in our church body. It is a place of worship, guidance, rest and healing. Take time to stop and reflect on how God is calling you to involve the church into our lives instead of trying to be self sufficient. 9 Lavender – Lavender has historically been an image that represents healing. Take time to stop and pray for God’s healing in this area. 10 Lamp – A lamp is lit to give clarity, security and guidance. Take some time to pray that God would illuminate your next steps and what it looks like to actively trust Him in this area.